Virtual Reality is a 3D computer generated environment, real or imagined which allows a user to interact with the environment. The first known mention of VR was in 1935 in a short story called Pygmalion’s Spectacles by Stanley G Weinbaum. It described a goggle-based system with holographic recording of fictional experiences including smell and touch. In a virtual reality environment, a user experiences immersion, or the feeling of being inside and a part of that world. He is also able to interact with his environment in meaningful ways. 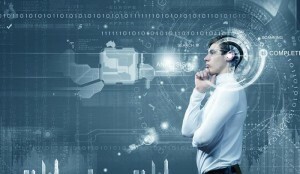 The combination of a sense of immersion and interactivity is called telepresence. Computer scientist Jonathan Steuer proposed two main components of immersion: depth of information and breadth of information. Depth of information refers to the amount and quality of data in the signals a user receives when interacting in a virtual environment. For the user, this could refer to a display’s resolution, the complexity of the environment’s graphics, the sophistication of the system’s audio output, etc. Steuer defines breadth of information as the “number of sensory dimensions simultaneously presented.” A virtual environment experience has a wide breadth of information if it stimulates all your senses. Most virtual environment experiences prioritize visual and audio components over other sensory-stimulating factors, but a growing number of scientists and engineers are looking into ways to incorporate a users’ sense of touch. Systems that give a user force feedback and touch interaction are called haptic systems. This is followed by the first type of multimedia device in the form of an interactive theatre experience, devised by Morton Heilig, and known as the ‘Sensorama’. This early form of virtual reality was invented in 1957 but was not patented until 1962. • A viewing screen within an enclosed booth which displayed stereoscopic images. 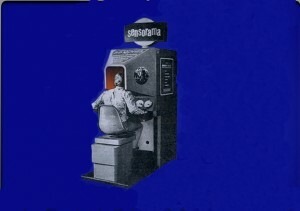 The viewer would sit on a rotating chair which enabled them to face this screen. They would be shown these stereoscopic images which gave the illusion of depth and the ability to view something from different angles. The first head mounted display (HMD) was developed around this time by engineers at Philco Corporation. This was entitled ‘Headsight’ and was designed to be used by helicopter pilots who needed to be able to see their surroundings whilst flying at night. In 1968 Ivan Sutherland created the Ultimate Display: a head mounted display (HMD) attached to a computer which enabled the wearer to see a virtual world. But the sheer weight of this display meant that it had to be attached to a suspension device. Step forward to the 1980’s where virtual reality was used on projects for NASA as well as research into new forms of human-computer interaction (HCI). This was carried out by Dr Michael McGreevy – an authority in this field and several other spheres who developed some innovative virtual reality systems. The 1990s saw virtual reality really starting to influence the gaming sector. In 1991, the technology was added to arcade games by the Virtuality Group, before Sega unveiled their wrap-around headset in 1993 and Nintendo released the Virtual Boy in 1995. Today, most virtual environment (VE) systems are powered by normal personal computers. PCs are sophisticated enough to develop and run the software necessary to create virtual environments. VE systems need a way to display images to a user. Many systems use HMDs (head-mounted display), which are headsets that contain two monitors, one for each eye. The images create a stereoscopic effect, giving the illusion of depth. 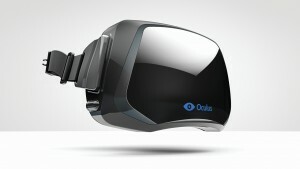 The Oculus Rift is such an example of Virtual Reality headset. Now lets get to the important features of HMD. The display is the most obvious part of the HMD, in the visual center of the device. Today, an HMD might use one of several techniques to transfer images to brain, but the most common is the use of liquid crystals.Pixels (short for pixel elements) are the dots that make up a picture. The more pixels you have in every square inch of display, the crisper the image. The refresh rate in an HMD refers to how quickly a display can change its content over a particular length of time.Typically modern LCD computers have a maximum frame rate of 60 frames per second or 60 fps where one frame equals a complete image on your screen.The more frames used in a given second, the smoother and crisper motion appears in a virtual environment. It seems so far that 60fps is the minimum needed to achieve this, but HMDs as high as 120Hz are already in existence. Latency is the term used for the time between input and output. For the layman, that means the time it takes for the picture in your VR world to catch up to your new head position each time.The latency must be low to get a good immersive experience in a virtual environment. In order to create that immersive feeling of inhabiting a virtual world, you have to stretch a flat image to fill your visual field entirely. This is commonly referred to as optics. Experimentation by the University of South California indicated that a HMD would achieve the visuals needed for a convincing virtual reality if it had a field of view (FOV) of between 90 and 100 degrees. The HMD needs some accurate head tracking technology to acknowledge user head position and transform it into data. For this a multi-axis accelerometer is put on a chip allowing infrared tracking cameras to accurately watch markers on the HMD and relay positional data to the computer. Mobile HMDs cannot make use of external camera tracking because they are not for use in a fixed location – but some new technologies, such as the Microsoft Hololens, and Google Project Tango, can use multiple sensors in addition to accelerometers for positional calculation. A logical follow-on from head tracking is eye tracking. Eye tracking tracks where user’s eyes are currently looking and can extrapolate that information to change it into visual data. Virtual characters could potentially react to user’s gaze, to quickly select items in user’s virtual world. Finally about audio hardware, HMD’s provide option to use external headphones with them while some include their own optional headphones. Other VE systems project images on the walls, floor and ceiling of a room and are called Cave Automatic Virtual Environments (CAVE). The University of Illinois, Chicago designed the first CAVE display, using a rear projection technique to display images on the walls, floor and ceiling of a small room. 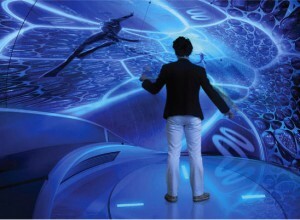 Users can move around in a CAVE display, wearing special glasses to complete the illusion of moving through a virtual environment. CAVE displays are very expensive and require more space than other systems. Virtual worlds combine the power of 3D graphics and internet which allows users to create versions of themselves called avatars to interact among themselves in a virtual world. Massively multiplayer online games depict a wide range of worlds including those based on science fiction, sports, horror, super heroes and the real world. Second Life, arguably the most popular of these games, has seen massive successes, which includes creating millionaires out of some of their long-time and most dedicated players. This is made possible by their own currency and exchange rates. Virtual worlds are not limited to games but applied to many fields like economy, geography, research, social, commercial, entertainment, education etc. 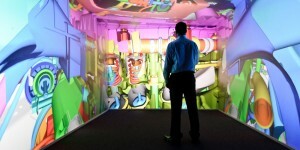 Virtual worlds may increasingly function as centers of commerce, trade, and business. With the increased growth of virtual asset trade being seen: In Second Life, revenue has reached approximately 7 million US Dollars per month. Real world brands such as Coca-Cola have used virtual worlds to advertise their brand. 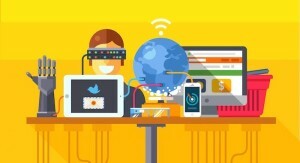 Virtual reality allows us to go beyond the limitations of physical tools to do anything that can be computed. If you want to create a two-mile high tower made out of toothpicks, you can do it. Automobile companies used it for car design. Oil and gas industry used it to visualize data to figure out the right place to sink a well. The biggest way [VR is changing the workplace] is training and simulations. If you have to train somebody on a very expensive piece of machinery, you want to do it in a simulator. The Army, for example, has been an extremely early adopter. In education, the biggest change has been Google Expeditions. Google has been seeding elementary schools with over 100,000 virtual reality headsets and lesson plans. Kids are able to go on a virtual reality field trip to, say, to the surface of the moon. Despite the wide-reaching existing benefits of virtual reality, it appears we have only scratched the surface of the potential this technology can offer. Statistics have predicted that the industry will be worth a staggering $407.51 million by 2018, with over 25 million people regularly using the technology. With such growth predicted, many more sectors are set to be impacted.